The question is not an unfamiliar one because we dawdle. Monkeys call Man “the wobbling biped” because his balance is questionable and because she constantly second-guesses herself. If you’re a monkey, you don’t worry about these things; you enjoy your tropical fruit. If you’re a cobra, the question doesn’t even make sense. That’s why cobras don’t listen to The Clash & why their strike is liquid lighting. The said beasts are emissaries for a model of the brain that neuroscientist Paul MacLean called “the triune brain.” The man, the monkey, & the snake in their respective attitudes, represent the tripartite activity of the human cognitive organ. 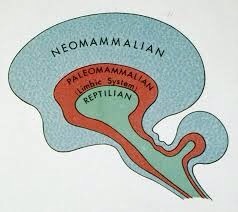 The germ of the organ—the basal ganglia, cerebellum, & brainstem—consists of what MacLean called the “reptilian complex.” This directs the most basic and barbarous functions, organising vital forces into cohesive patterns to birth an organism from general chaos. From his pedestal atop the spinal cord, this blind conductor orchestrates all autonomic and instinctual activity—the pulse is her metronome & the breath her orchestra. Digestion is a leitmotif of his magnum oeuvre; the intricate sequencing & coordination of kinetic motion the crescendo of his ballet. When the cobra strikes, it represents the culmination of this instinctual genius. The execution is consummate…and entirely unconscious. Ensconcing the primeval “lizard brain,” MacLean conceives of a second cerebral aspect. He calls this addition the “paleomammilian complex.” This complex includes such sundry structures as the septum, amygdala, hypothalamus, hippocampal complex, and cingulate cortex, together which constitute the notorious limbic system. From the interplay of these structures emerge desires, drives, & urges. Freud’s fascination was obviously in this aspect. The impulses of the paleomammilian complex constitute the dramatis personae of the five-act play inside our heads. In our inner (melo)drama, the former appear in character, masquerading as a myriad feelings, sentiments, & emotions that parade through our consciousness. When a monkey snatches up a banana, he also desires it. Through this development we notice a sort of layering, analogous to a producer adding vocal tracks in a recording studio at 2 am. Each cerebral stratum contributes a new dimension; a new track to the song of our experience. The reptile acts with such sparse neurological signaling that it is not altogether clear that the creature even knows it’s acting. The monkey, however, experiences desires & aversions that consequently impel him to action. Emotion itself literally means “to move out of”—from the latin emotus, via Old French. Deed rides atop the steed of desire, action upon the cavalry of emotion…if you’re a lemur. Activity for the mammal sacrifices clarity for dimension, like singing in the bathtub instead of an interminable birch forest in eight inches of fresh snow, or in outer space. Through the contribution of the limbic system, resonance arises in mental processing. Reverb begets richness, but concomitantly kills the crispness of instinctual activity. In this way, the executive ability of the neocortex creates for man the pernicious portal to an internal void of infinite regress; an echo-chamber so potent that one ceases to recognise the original chord altogether, lost as the latter is in the psychological cacophony. It is not the wish of the editor at The Way of the Elbow to romanticize existence as a gecko or a baboon. Certainly even that the former has the option to consider decivilising is a noble testament to the neurological majesty that is the human cerebral cortex. Every lizard is a philosopher, but not by will—for the reptile dips into the primordial well of universal instinct for his sips of wisdom. Man, cast out from the Garden as he is (a reptile tricked him, incidentally, for “the serpent was more subtil than any beast of the field” Genesis 2:1) must learn for himself—he must dig his wells from scratch thereby to quench his thirst for knowledge. In a way the human condition is tragically admirable therefore. Man was the first animal on the face of the Earth to suffer. It might be that a paramecium feels pain, but it never suffered; the former being a basic instinctual response to a harmful stimulus, the latter the agonizing bedlam babble that results when the initial stimulus is compounded ten-thousand times in our cerebral echo chamber. Twirl an ember in the dark and we see a solid circle; just so is affliction amplified in our experience—we are scorched circle of flame where the beast bears only the prick of a single point in phenomenal space. Pain is physical; suffering its manifold multiplication by the habits of human psychology. 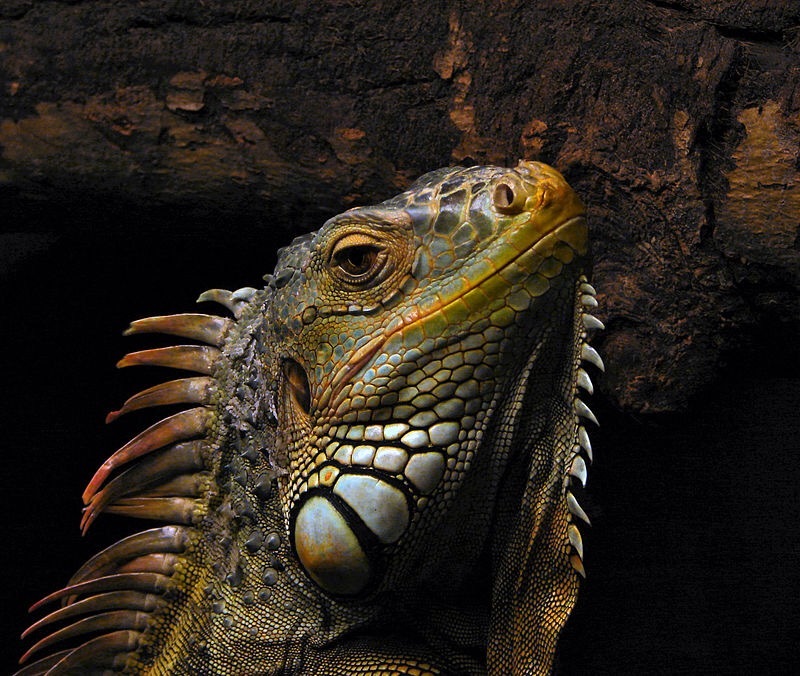 To recapitulate, the reptile dwells deep in the primordial (un)consciousness of instinct. The mammal rises further into the semiconscious realm of impulse & emotion. Human consciousness achieves the most rarified stratum of them all by achieving self-consciousness. Each layer of awareness folds back on itself & those below it, like so many gyri & sulci on the surface of the brain itself. Unconscious, subconscious, & self-conscious: lizard, monkey, man, approximately! In a subsequent installment, we will examine the possibility of harmonious coexistence between the friendly beasts, & consider how Rolfing® SI can mediate!